In I am lifeguard. Hear me roar. 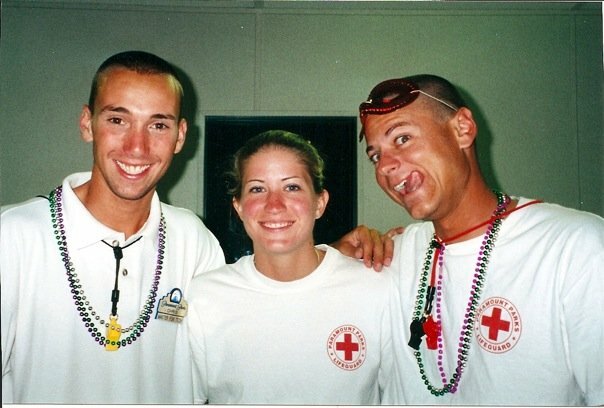 (Part 1), we looked at a few of the pros & cons of my college summer job as a lifeguard. I thought maybe we would start that way again. Lost kids. There were days where I was convinced that parents brought their kids to the park simply to not go back home with them. Teva tan. My feet looked like a tic-tac-toe board for a quarter of the year. Season pass holders. From a business perspective, I absolutely understand the value of season ticket holders. Many of them were quite awesome. There were others who were convinced that because they paid a few extra dollars, we should let them do absolutely anything. People who think they are above the rules. It’s so awesome that your kid is 36″ tall. This ride says 48″. I’m not getting fired or sued or putting your kid in danger because you don’t want to explain why the mean man in the big, floppy hat is asking you to go back down the stairs. Oh, that sign you hung your towel on, it’s the one that says 48″. Rainy Wednesdays. This was the equivalent of the double rainbow. Tips for you park goers. Wednesdays are the slowest days of the week. If there is rain in the forecast, the park often looks like a wasteland and you never have to wait in line. We’re not closing unless there is lightning or the rain is so hard that we can’t see the bottom of the pool. For lifeguards, these days are great. Fun guests. We knew just how to take the huge 4-person rafts off the conveyor belt and place them in the pool so it completely drenched the people in line. Some people couldn’t believe that we would do that. Gosh forbid, you get WET at a WATER PARK moments before you get in a POOL and go down a SLIDE in to a BIGGER POOL. Other guests would ham it up with us and make our days fly by. Me likey happy guests. First waves. The morning at a water park is a serene, beautiful place. You can hear gentle splashing from some of the kiddie areas. The air is cool. The wave pool is poo-less. The temperature is perfect. The first time the waves would come on was awesome to watch and was very relaxing. With no one in the pool yet, the waves are completely glassy. I loved watching the first set roll out. Authority. We were a group of college guys. We played on the lacrosse team. Regular conversations started with “what if we [insert juvenile/hilarious action]”. Somehow, we demonstrated that we could handle running a park full of people. We were actually quite good at our jobs. I previously explained how we were great lifeguards, but we were really good at administration and operations…when we wanted to be. Now, I’m not saying we “abused” our power, but we might have “used” our power to benefit us…a little…sometimes…daily. We were responsible for assigning lifeguard rotations each morning. Guards would rotate spots in different places in the park every hour. This was to keep everyone fresh and alert. If you were left in the kiddie area by yourself for more than an hour, you might explode. This would be bad because we’d have to shut the pool down. As supervisors who previously and extensively worked on all the rotations, we knew which lifeguard rotations were the best. We also knew which lifeguards were the coolest, best and most fun. Those were the guards that got the good rotations. We knew all the positions where we could do our job, but still be out of sight from the big wigs. There was a certain position on the back side of the lazy river that was completely out of view from most vantage points. Hanging out there was great. The only way the lifeguard could see me approaching was if they turned their whole body around. So, I typically just ran up and scared the guard, then stuck around for a while. Dating the lifeguards was typically frowned upon. Dating lifeguards was also typically one of our pastimes. Would you like to take a guess at which lifeguards did NOT have to clean the bathrooms or get stuck on the worst rotations? Yes, the ones we were dating at the time, or the ones we wanted to date. The advantage of leading the preseason training classes was that we could scope out the incoming lifeguards. Apparently I did such a good job talking up one of my best friends that the girl he called ‘dibs’ on started dating him. They are married now and have a beautiful daughter. Mission accomplished. The most difficult days were the ones with tons of people who didn’t want to listen to us. There’s a yellow line. There’s a sign that says “stand behind the yellow line.” Why are you three feet past the yellow line? Hello oblivious visitor, do you realize that there is NO ONE else wandering around where you are? Hi there, grown-man-who-thinks-he’s-the-first-to-ever-play-like-he’s-drowning. Haven’t seen that one today. Good one. Please stop. *Actual quote used by a friend and possibly the funniest line I’d ever heard at the time. Good day to you, kid-who-won’t-get-off-the-rope. Please get off the rope. Get off the rope, please. Get OFF the rope. <grabs megaphone> GET OFF THE ROPE! We begged. We pleaded. We tried to be nice to these rule breakers. For some people, we told them once to stop doing something and they listened. For others, it’s like the chlorine warped their ability to comprehend simple commands. How frustrating it must be for God when I act the same way as the people I’ve described over and over again. How many times must I do the same sin and have God repeatedly try to communicate to GET OFF THE ROPE?. In the wave pool, the rope marked the point in the pool where the bottom started sloping down to the deep end. We told people to get off the rope for a couple reasons. First, we didn’t want them to get hurt. Second, we didn’t want them to get in the way and block the visibility of the rope to someone who might need to see it. When I sin, I’m not only disrupting things for me, but depending on what I am doing, I might be preventing someone else from living purely. Romans 5:19 says “For just as through the disobedience of the one man the many were made sinners, so also through the obedience of the one man the many will be made righteous.” When I am diligent in my quiet times, in my prayer life and in my actions, I can help encourage my brothers and sisters. When I disobey, I can also help bring down those around me. I see this with my kids. When my son, the big brother, disobeys, his little sister tries to do the same thing. In order for me to be obedient, I need to be in the Word. 2 Timothy 3:16 says “All Scripture is God-breathed and is useful for teaching, rebuking, correcting and training in righteousness…” You see, just as much as I need for God to blow his whistle and tell me to get off the rope sometimes, I need to do so willingly. Here’s something I never did. I never got down out of my lifeguard chair, swam out to someone and thanked them for listening to me. There are definitely times when I beg and plead with God through prayer for Him to take control of my situation. But, when He responds, I never take the time to give Him the thanks He deserves. Psalm 100:4 reminds us to “Enter his gates with thanksgiving and his courts with praise; give thanks to him and praise his name.” There are over 80 references to thanks or thanksgiving throughout Scripture. This is something that God obviously wants us to do. Heavenly father, thank you for hearing my prayers. Forgive me for failing to acknowledge you and your actions. I recognize your greatness in my life. Thank you for alerting me when I disobey you. Thank you for your patient and corrective hand. Amen.